Hear a noise that sounds like a cat who’s gotten itself stuck in the branches of a tree? Well, if you hear that “Mew Mew” at the Inn on Mill Creek, it’s likely you’re listening to the Gray Catbird, our final pick of the year in our monthly Birding at the Inn series on the blog. The Gray Catbird is a medium-sized bird that gets part of its name from its coloring (note the darker top of its head, which helps with ID’ing the bird), while the other part of its name comes from the animal it mimics in its call. Just like its relative, the Northern Mockingbird, the Gray Catbird is also a remix expert, with the ability to copy sounds of other birds and animals and turn those sounds into strings of long songs. Along with a chattering call, the Gray Catbird’s most frequent call sounds just like an angry raspy-voiced cat. No joke. If you have a cat, think of your feline friend getting angry with you and yelling at you and that’s the sound of the Gray Catbird. The best place to spot the Gray Catbird at the Inn on Mill Creek and in the mountains around Asheville is to look in dense thickets of rhododendron and mountain laurel as well as other shrubs and trees, too, especially berry bushes, rose bushes and fruit-bearing trees. 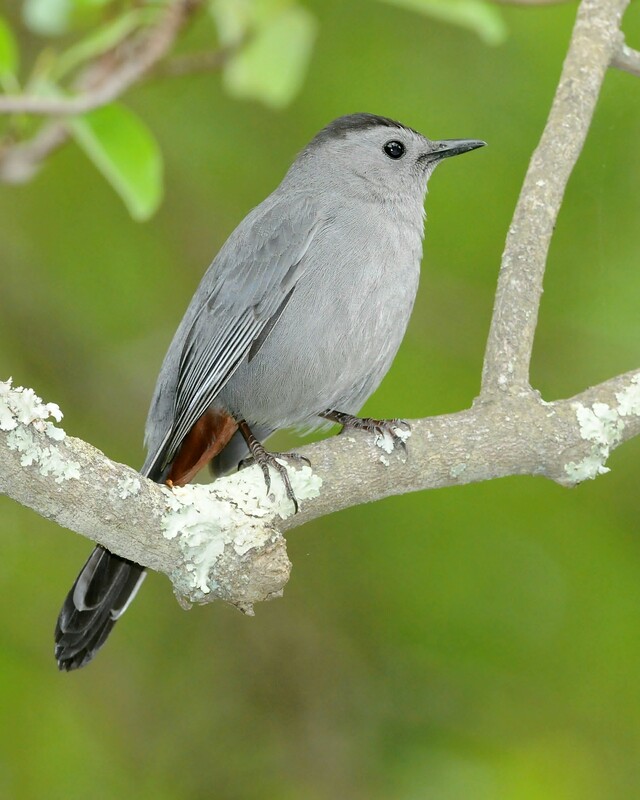 We’ve seen Gray Catbirds both at the Botanic Garden of Asheville and Biltmore Estate, both of which provide plenty of good spots for the Gray Catbird to live and hang out.